Andrew Garfield will return to the role of Peter Parker and Marc Webb is set to direct as Columbia Pictures prepares to begin production on the next installment of The Amazing Spider-Man™, it was announced today by Doug Belgrad, president of Columbia Pictures, and Hannah Minghella, president of production for the studio. The screenplay is by Alex Kurtzman & Roberto Orci and Jeff Pinkner based on a previous draft by James Vanderbilt. The film will be produced by Avi Arad and Matt Tolmach. The new chapter in the Spider-Man saga is set for release in 3D on May 2, 2014. Emma Stone is also in talks to return to the blockbuster franchise and is expected to reprise her role as Gwen Stacy. The new film will begin production in early 2013. Webb, Garfield and Stone previously teamed on this summer’s blockbuster The Amazing Spider-Man, which has taken in more than $751 million worldwide. The ‘Hawa Hawaii’ damsel will be soon making an appearance on AB’s acclaimed quiz show ‘Kaun Banega Crorepati 2012. KBC 2012 has taken the television world by storm, we know, you know and precisely why tinsel town never stops turning up on the sets of KBC to promote their movies. Guess what - Sridevi will be the first celebrity contestant on the show this year. So what happens when this couple that has delighted many in the mast with their on screen appearance gets together on KBC 2012 once again? It will be a reunion of sorts as after 20 years these two legends will share the screen space again after their silver screen hit Khuda Gawah. There will be laughter, some English Vinglish , fun and much more! Not to forget those multiple choice questions. And adding to that will be a visual delight of sorts when both AB & Sridevi will be dancing to the tunes of none other than MJ. This when, Big B reveals to all that he knows how big a fan of Michael Jackson Sridevi is and requested her if she could show everyone a few moves. Sridevi gladly agrees but with a small condition – AB to join her as well. So Sridevi imitated MJ to the core and AB too went along. It was a sight to behold. MIW foundation with support of Supreme Infrastructure India Ltd. has organized a Self Defense Training Workshop for NSS volunteers of Bharati College conducted by Delhi Police at Bharati College (University of Delhi) Janak Puri. It was more than a 10-day Training workshop where students were trained with various techniques of Self Defense starting from 14th September, 2012. More than 150 students have participated in the workshop. The workshop deliberated on various dimensions of training in self defense to the girl students of the College including psychological and legal aspects as well as the role of police. The participants also discussed the methods of self defense like Judo - Karate, Tae-kwon-do etc. The workshop was a tremendous success with college students turning out in large numbers and they all felt encouraged by the endeavor of the Commission to enable them fight the evil of eve-teasing and other sexual harassment. Shri Mahabal Mishra, Member of Parliament, Government of India was the chief guest and he distributed certificates to the participants. Mr. Vikas B Sharma (Director) Supreme Infrastructure India Ltd.), Ashish Bhutani (Managing Trustee ) MIW Foundation, Dr. Promodini Varma (Principal) Bharti College, Delhi Police Inspector Omwati Malik, Mr. Vicky Ahuja (Director), God’s Grace Distribution, Shri Vijay Sharma (Volunteer) were Honoured for their Valuable contribution in “Self Defense Training Workshop”. SUPREME INFRASTRUCTURE INDIA LIMITED [BSE code: 532904] is a public limited company with registered office near IIT Powai -Mumbai, India, promoted by Mr. Bhawani Shankar H. Sharma - Chairman and ably supported by Mr. Vikram B. Sharma, Managing Director and Mr. Vikas B. Sharma, Whole-time Director. The Company got listed in 2007 on the BSE & NSE. SUPREME INFRASTRUCTURE is one of the promising companies in India having turnover of Rs. 1521 crores. The company has been formed to undertake engineering works of unrestricted value with most of the Government departments, public & private sector organizations. It is tribute to the company’s outstanding performance that national & international contractors have expressed their interests for partnership on equal footing for mega size projects. Apart from the latest methods and techniques, the company has introduced automation in its working styles. Use of QA / QC methods, Project Management & Control Tools, Safety Manuals, is the hallmark of company’s operations. As an organization, it is always on the move to improve its productivity further by resorting to new management of tools as they become available. The company does not rest on the laurels and continues to endeavor towards the future progress & development to reach the peaks of the engineering profession viz, Excellence, Expediency and Economy. And, by doing this, it is proud to say that it can carry out the construction work in keeping with these three E's. It is now a Pan India EPC player. - Supreme Infrastructure is present in 6 verticals and 10 states in the infrastructure space. - Supreme Infrastructure India Ltd. pursues an integrated execution model with captive aggregate mining and asset ownership enabling speedy & timely execution. - Railways, Bridges, Buildings, Power, Sewerage, Irrigation, Water and Roads are the key verticals within the company. - Company has a total of 9 Road BOT projects of which 2 projects have begun tolling operations. - Currently Supreme is executing work at about 40 sites. Timeless Zeenat Aman Show Stops for the Ace Designer Rehan Shah for Timeless Paragon- Classic Diamond Jewellery!​!! At a Classic Fashion Show showcased by Designer Rehan Shah blending with the sparkling Diamond Jewellery by Timeless Paragon at Yeti, Kathmandu. Who could have been a better Show Stopper than Zeenat Aman? Zeenat Aman readily agreed to walk for Rehan Shah& looked stunning in her Golden & Black Gown. She walked reigning as queen with the Golden Studded Crown. Rehan roped in the best in the Industry to walk for his show Alicia Raut, Shonal Rawat, Anchal Kumar, Deepti Gujral, Amruta Matki, Sucheta Sharma, Arshina Trivedi, and Sakshi Chaudhary who walked wearing the elegant & beautiful gowns donning sparkling jewellery. Rehan Shah put up a fantabulous show as he himself choreographed the show for Timeless Parag. At an emotion filled evening, Yash Chopra on his 80thbirthday, in conversation with Shahrukh Khanyesterday, took everyone by surprise when he announced his retirement from directing films post his Diwali 2012 release, JAB TAK HAI JAAN. An enlightening trip down memory lane, from his early life and his first film, DHOOL KA PHOOL in 1959, Shahrukh took the master storyteller and the undisputed king of romance, through his life’s journey. Several identifiable and nostalgic memories dotted this lifetime of a truly passionate filmmaker. 22 films spanning a career of 53 years as a director; over 40 years as head of Yash Raj Films, and a lifetime of yeoman service to the Indian Film fraternity, Yash Chopra has stood for the one principle he strongly believed in all his life which was instilled in him by his mother, ‘Apne dil ki suno’, (“Listen to your heart”). 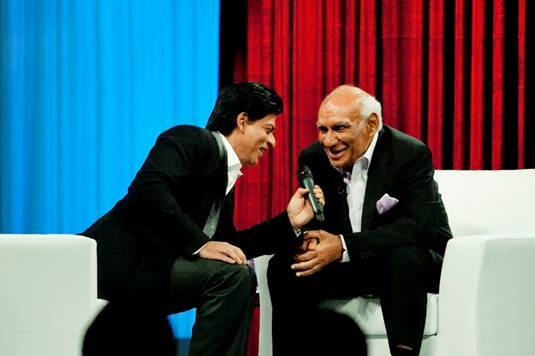 If you missed The Journey of a Legend, watch the conversation and celebrate and enjoy Yash Chopra’s illustrious journey. This went out live yesterday exclusively on the YRF YouTube Channel and was extensively carried by all major TV channels and continues to reach out to millions of Yashji’s fans. Surprisingly a fantastic singer for a Doctor to be, US based multifaceted artiste Biba Singh to launch her single ‘Nachne De Chaa’ shot in the soils of Punjab, India. Music & Medicine being her life, Biba Singh born & brought up in US is proud daughter because her parents brought her up as Indian Parents & kept her connected to Indian Culture in every way they could. Doctor by profession in New York City, She commenced singing since 7 years of age & sang Shabads in the Gurudwara & over the years the encouragement, love & motivation of her Teachers & her parents kept her going & Now she returns to the Indian soil to launch her new album. Standing tall in the Indian Pop Music Industry, she gives credit to her childhood friends Daler Mehendi, Nikki Mehendi, Mika Singh Pinky & Jatinder Paras, Vijay Wadhwa, and Savita Ahuja who have motivated & guided her in every step of her music career while she pursued medical education in the US. She could not have had a better kick start to her career when the legendary King of Disco Bappi Da Launched her first Album ‘Biba for You’. Biba Singh, versatile singer that she is has a penchant for Rustic, Folksy but peppy Punjabi Tunes bringing back the Punjabi Tradition by blending Punjabi tunes with rock & pop melodies for today’s youth. Dr. Biba Singh, as we would address her, loves her profession & confesses that it has helped her become a better human being. To release her next chartbuster single has always been on her mind & she has put her heart & soul. She has come all the way, Saat Samundar Paar, she surely deserves all the blessings & good luck. इश्क इन पेरिस की शूटिंग के दौरान एक क्रू मेम्बर जख्मी हो गया था उस समय का प्रिटी का शाट चल रहा था जैसे प्रिटी को इस बात की खबर मिली वो तुरंत शूटिंग छोड़ के उस आदमी से मिली और तुरंत उसको अस्पताल भिजवाया ! प्रिटी ने उसकी और उनके परिवार वालो की काफी मदद भी की और काफी भावुक भी हो पड़ी ! At the time of shooting a crew member get injured on the set when Preity come to know about this left her shoot and sent him to the hospital and helped & care his family alot because she is very kind hearted girl..
KE$HA RELEASES‘DIE YOUNG’ WITH A UNIQUE LYRICAL VIDEO! Global superstar Ke$hareleased her first single “Die Young’ from her sophomore album, WARRIOR. The first single “Die Young” premiered at radio and releases with a unique lyrical video which is not become a new phenomenon. The single has been co-written by Ke$ha, Nate Ruess from fun., Dr. Luke, Benny Blanco and Cirkut. Executive producedby Kemosabe Records head Dr. Luke, WARRIORfeatures tracks written by Ke$ha, as well as collaborations with producers, writers and musicians including, will.i.am, Max Martin, Benny Blanco, Cirkut, Bonnie McKee, Wayne Coyne, Iggy Pop, Patrick Carney, Ben Folds, Greg Kurstin, Kojak, Ammo, and Billboard. There will be a 12 track standard version of the album and a 16 track deluxe edition. Additionally, there will be an exclusive version of the album that will be sold at www.keshasparty.com and will include a special bonus 5 song acoustic EP. Producer Chandru punjabee is known for great hospitality. He had organised a bhajan evening for close family and friends He had visitors whole day ,the evening had over 200 people thronged to see the special ganpati daughter geetu punjabee and son harsh punjabee also ensured all were given prasad before they left. The music and the devotion spirit was apparently had taken all in its stride The decor of blue and purple orchid matched the colour of the ganpati. महाराष्ट्र में आज कल गणपति उत्सव् की धूम मची हुई है सभी बप्पा का आशीर्वाद लेना चाहते हैं देसी या विदेशी सभी इस उत्सव के रंग में रंगे नज़र आ रहे हैं. तो ऐसे में जर्मन मॉडल खूबसूरत क्लौडिया भी कैसे पीछे रहती? वो भी पहुँच गयी t v 9 के इको फ्रेंडली गणपति पंडाल की आरती में शामिल होने के लिए . १८ फीट ऊँची गणेश की यह प्रतिमा मिटटी से बनाई गयी है.भूरे रंग के सूट में क्लौडिया बिलकुल भारतीय नज़र आ रही थी. उनसे पूछने पर कि आप यहाँ कैसे ? तो उन्होंने कहा कि, मैं मुंबई में कई सालों से रह रही हूँ और अपने दोस्तों के साथ गणपति उत्सव् मनाती रही हूँ और बप्पा का आशीर्वाद भी लेती रही हूँ तो इस बार कैसे मैं यह मौका छोडतीदेती. यहाँ इको फ्रेंडली गणपति देख कर मुझे बहुत ही अच्छा लग रहा है सभी भक्तों को ऐसी ही प्रतिमा की पूजा करनी चाहिए." A day after Lata Mangeshkar's interview to this newspaper titled "I am far from perfect - I have a fierce temper" dated September 25, 2012, where the songstress recalled her fight with (late) Mohd Rafi over royalty rights and said she later got a written apology from him, Rafi's son Shahid Rafi has come out in strong protest, alleging she is lying and maligning his father's name, especially now when neither Rafi nor composer Jaikishen are alive to defend themselves. "At a meeting attended by prominent singers and musicians, Rafi Saab stood up and said, 'Main aaj se Lata ke saath nahin gaoonga'. I retorted, 'Rafi Saab, ek minute. Aap nahin gaayenge mere saath yeh galat baat hai. Main aapke saath nahin gaoongee'. I stormed out and called my composers there and then and informed them to rope in another singer if it was a duet with Rafi Saab." Asked about their patch-up, she had said, "Composer Jaikishen took the initiative. I asked him to get a written apology from Rafi Saab. I got the letter and ended the cold war. But whenever I'd see him, the hurt would return." Shahid Rafi, explaining their side of the story, says "The controversy went on for a while. Lataji and some other singers were looking for royalty, saying they should get a cut from the producer, director etc. My dad wasn't very keen on that. He was this humble, soft spoken, amazingly generous person. His stand was, 'Our job is to sing and we get money for that. There is no point in getting greedy'. Hence, they had a fight and he decided to stop singing any duet with her." Questioning Lataji's claim that his dad had given her a written apology, he adds, "If that is the case, let her show the letter. My father passed away about 25 years ago, and now she is talking about this letter? People keep valuable documents for even fifty years. Why hasn't she retained the paper which would give her dignity?" Shahid's version of the patch-up is rather different. He says after his dad stopped singing with Lataji, he continued getting offers for duets and opted to sing with another brilliant singer, Suman Kalyanpur. At this point, Lataji started feeling insecure and approached composer Jaikishan to make peace between them. "When Jaikishan approached my father and requested him to make amends with Lataji, he immediately agreed because he wasn't the kind to hold on to grudges. But there is no way he would have apologised to her because he always stood by his principles. Why didn't she bring up this issue when he was alive?" Shahid says, adding, "I don't have to give any further justification about my dad's reputation. Even today, my dad has more followers than Lataji."